In 1867, Russia sold its interest in Alaska to the United States, and for nearly fifty years the region was known as the District of Alaska. The first Governor designated a Seal featuring icebergs, northern lights, igloos and an Eskimo ice fishing. In 1910, this Seal was replaced with a design by an “unknown designer” more representative of the District’s industrial and natural wealth. 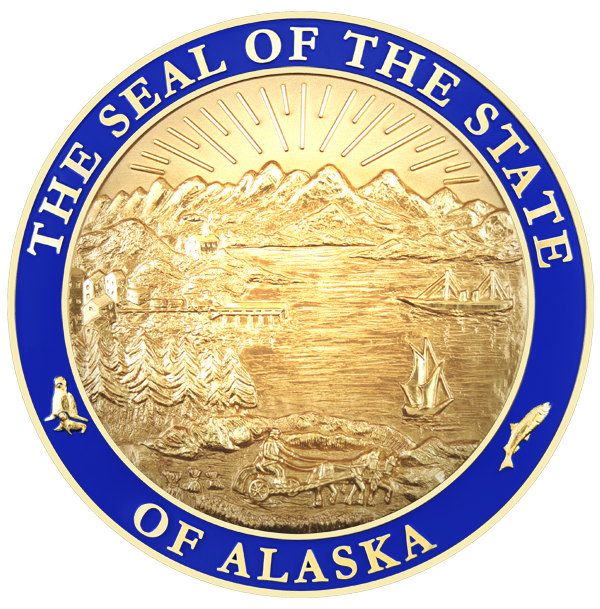 This Seal was retained through Alaska’s territorial days and by adoption of Alaska’s constitution in 1956 became the State Seal when Alaska joined the Union on January 3, 1959. The rays above the mountains represent the famous Alaskan northern lights, also known as aurora borealis. The smelter symbolizes mining, the train stands for Alaska’s rail transportation, and ships denote marine transportation. The trees symbolize Alaska’s wealth of timber and other forest products, and the farmer, his horse, and the three shocks of wheat portray Alaska’s agriculture. The fish and seals signify the importance of seafood to Alaska’s economy. 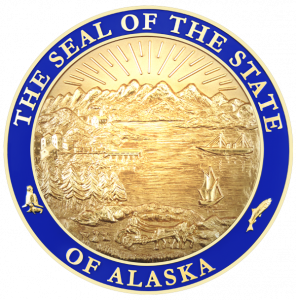 Although road and air transportation, oil and gas and tourism have developed considerably since the Seal was designed in 1910, Alaska’s State Seal still represents the vast wealth, economy and incredible natural setting of the forty-ninth State. The official seal of the State of Alaska is comprised of two concentric circles between which appear the words “The Seal of the State of Alaska” and within the inner circle is the design of the seal corresponding to the representation in this section. Sec. 44.09.015. Use of seal without permission prohibited. (a) A person may not use or make a die or impression of the state seal for any advertising or commercial purpose, unless written permission has first been obtained from the lieutenant governor. (b) Violation of this section is a misdemeanor, and upon conviction is punishable by a fine of not more than $500, or by imprisonment for not more than six months, or by both. Revisors Notes – Formerly AS 11.60.225. Renumbered in 1978. To request permission to use the State Seal contact April Simpson (907-465-3509) for assistance.